Phil joined the staff of GIPC on July 1, 2009. 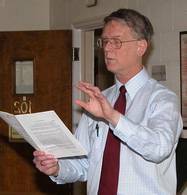 He is a native of Central Illinois and a graduate of University of Iowa and Princeton Theological Seminary. In 2017, Phil completed his advanced degree, Doctor of Ministry in the Missional Leadership Cohort at Fuller Theological Seminary in Pasadena, Cal. He is ordained as Minister of the Word and Sacrament in the Presbyterian Church (U.S.A.). In the past, Phil has served congregations in Minnesota, Kansas, Illinois, and Michigan. His other interests include exercise, golf, and keeping current in theology as well as activities in congregations throughout the United States. Phil's wife Marguerite is a speech pathologist for the Huron School System, a trained mezzo-soprano who sings on occasion with the Detroit Symphony and Kirk in the Hills. She was ordained as Deacon at the Kirk in the Hills Presbyterian Church. Jan holds a B.A. in Sociology and Religion from Cornell College. She has taught social sciences at the high school level, and was the Director of Christian Education at the First Congregational Church of Christ in Appleton, Wisconsin, before joining us in 1985. Jan was married to Dan; she has three adult children and two grandchildren. Grace is a long-time member of GIPC and has lived in Michigan all her life. She graduated from Alma College in 2009 with a B.A. in Psychology and then went on to be the Youth Director at Northbrook Presbyterian Church in Beverly Hills, Michigan, for three years. After leaving that position, she moved back home to Trenton and started working for GIPC in October 2012. Grace married John Morton in August 2017. Jim has been Music Director of Grosse Ile Presbyterian Church since 1975. He earned his D.M.A. in Choral Conducting in 1988 from Michigan State University. He and his wife, Elaine, live in Grosse Ile where Jim has recently retired from teaching and serving as the Music Director at the high school. Jim and Elaine have two children, both graduates of Western Michigan University, and four grandchildren. Doug held his first position as church organist at age 12! He went on to receive a Bachelor of Music degree from Michigan State University with highest honors. Doug is a talented arranger and composer, as well as performer. He is very active in the Downriver music community. 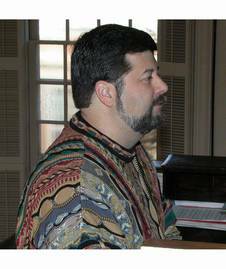 Doug has been organist at the Grosse Ile Presbyterian Church since 1985.